Hello everyone, welcome. 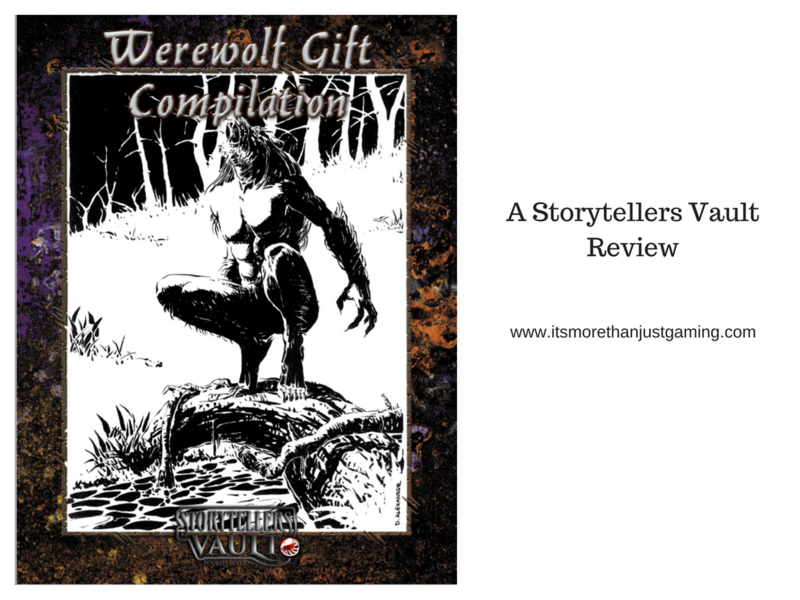 Today I am doing another review for the Storytellers Vault, though this time it is for Werewolf: The Apocalypse. Until recently, the Storytellers Vault was a portal exclusively for community content created for Vampire: The Masquerade and its offspring. Recently, templates were uploaded for the next line, Werewolf: The Apocalypse and accordingly we are seeing new content arriving for the warriors of Gaia and their foes. This review is for the Werewolf Gift Compilation by Zack Ball. Disclaimers. I was provided a free copy for review purposes. This Product is available from the Storytellers Vault, a website that I have affiliate status with. This means that any links to this product or the Storytellers Vault (or other related products on associated sites such as Drive Thru RPG) are tagged, and if you click them and buy anything, I make a small commission. In order to give you choice, I will also include a “clean” link free of tags at the end of this article if, for any reason, you want to support the product but not necessarily this site. Some background if you are unfamiliar with the game. In the game Werewolf: The Apocalypse players take on the roles of Werewolves, shape-shifting creatures created to be Gaia’s defenders. They are not limited to transformation during the Full Moon. Their bite won’t turn you. They have multiple forms ranging from actual wolf to 10 foot tall scary hairy wolf monster war form (not the technical name, you understand) and silver does indeed harm them. As with all the Changing Breeds (There are many other Werebeasts in World of Darkness) the Werewolves have a role to play; they are Gaia’s defenders and warriors. They fulfill this role in two ways as to be a Werewolf is to be a creature of duality. You are both Wolf and Human, physical and spirit. The shape-shifting is part of the fighting physically as is the Rage (capital R as it is a tangible thing) that lurks just beneath the surface of every Werewolf. Rage can push a Werewolf to do more in battle, ignore injuries and even restore them to the fight after a seemingly mortal blow. It can also cause them to enter a frenzy making them dangerous to everything around them. The second element of the Werewolf’s arsenal is their connection to the Spirit World. This manifests as Gnosis (think Mana for a mage) and Gifts. Gifts are abilities taught to Werewolves by Spirits granting them some measure of their power, depending on the spirit. So, a Hare spirit might teach a gift that increases the leaping range of a Werewolf, whereas something more exotic such as a Stormcrow might teach a gift that allows the Werewolf’s howl to sound like terrifying thunder. Personally, my favourite gift in the base game is taught by a Magpie and is called Thieving Talons of the Magpie, which allows the werewolf to steal a known supernatural ability from someone, preventing them from using it, allowing the werewolf access to it instead. Bye Bye vampiric superspeed! The Werewolf Gift Compilation is 30 pages or so of new gifts covering breeds (Breed is dictated by what your parents were, whether they were human/werewolf, wolf/werewolf or werewolf/werewolf), auspices (auspice dictates your role in the pack and is governed by what phase of the moon you were born under. I like the Ragabash Auspice, the Trickster Moon…), and Tribe (Think types of werewolf. Originally tribes were based on geography, but over time that is less important. Tribe governs overall outlook and the sorts of spirits they tend to deal with. I like Shadowlords…). It didn’t take me long to read through the compilation and given how many gifts there are to start with, despite the odd gift that felt a bit out of place or overpowered, there were loads of really cool new things that Werewolves can do. My attention was particularly drawn to the Shadowlord Gifts as there were a number of Thunder and Lightning related gifts that would work really well for an NPC Shadowlord I have in one of my chronicles. (The patron spirit of the Shadowlords is Grandfather Thunder, so it is unsurprising that being able to arrive as a bolt of Lightning is one such Gift). As with the core gifts there was some crossover, so one gift might start as a Children of Gaia Gift and be repeated elsewhere. There was not as much crossover as I was expecting, but that wasn’t really an issue for me. What was surprising was there were gifts for two extinct tribes, the Bunyip (I think they were Were Tasmanian Tigers and they supposedly became extinct in the 1930s) and the Croatoan, the middle of three Native American tribes which was wiped out centuries ago by a manifestation of the Wyrm (the main antagonist in Werewolf: The Apocalypse is the Wyrm, the spirit of corruption). 30 pages of gifts with some crossover. Croatoan Gifts focused on their role as mediators. Just in case you ever decide that a Croatoan actually still exists. Possibly outside the scope of this book (and perhaps something you could look at in the future, Zack Hint Hint), given the presence of Bunyip in this book Gifts for other extinct Changing Breeds would have been cool (am thinking Apis and Grondr, or Were Aurochs and Were Boars respective), however probably outside the scope of this title. When I think about it, I really don’t have much to complain about. I suppose the test of validity is would I use the Werewolf Gift Compilation in my games. As an ST who runs Vampire: The Masquerade/The Dark Ages Werewolves feature frequently as antagonists (or occasional reluctant allies against something worse). I had in mind a number of plots and NPCs for various stories I am running (including one that was spawned by another of Zack’s titles, Vicissitude Expanded) and I can see lots of the Gifts included in this title being incredibly useful and fun to show off with.